The year was 1990. I was a rookie director of the Philippine Marketing Association and was in charge of the youth and academe sector. This position connected me with many marketing professors, one of whom was Prof. Emmanuel Fernandez, then Chairman of the Management Department of the Ateneo de Manila University. He heard me give a short talk in marketing and invited me for coffee and chat in his office, where he asked me to teach marketing in his department. I was reluctant because I had no academic teaching background but was persuaded by him to try for a year. He saw in me what I did not know I had in me. The one year extended to over a decade and these were some of the most fulfilling years of my life. I fondly remember how one of my newly-graduated students then returned the second semester I taught, with a bag of cookies to personally thank me for making a difference in her shifting to a marketing career. Others asked for my teaching notes, which made me decide to convert these notes into my first book 'Contemporary Marketing Strategy in the Philippine Setting' (1992). 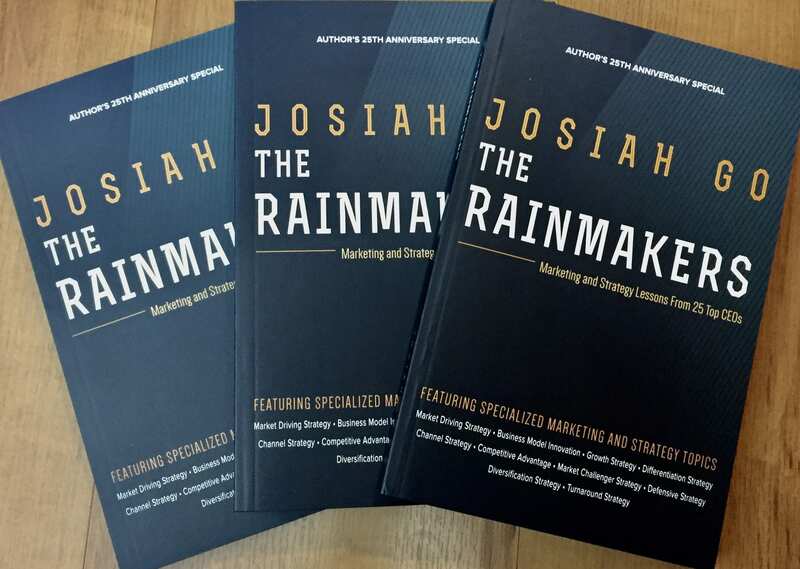 I launched a total of four marketing books in three years, typing away from nine in the evening to three or four in the morning. I founded the Ateneo Junior Marketing Association (AJMA) using my part-time teacher's salary as its initial fund. AJMA shifted from a mere social networking club to being a more socially-relevant student organization and went on to become the biggest student organization at the Ateneo de Manila. It won many awards, starting the term of Howell Cu as president. When Prof. Rodolfo Ang became the new Chairman (now Dean of Business School), he appointed me Director for the Marketing Minor Program (1992-1995). Rudy was instrumental in supporting me in the launch of AMOR (Ateneo Marketing Out Reach). This program made Ateneo and AJMA more relevant to the outside world by becoming a “big brother” to student leaders of many other schools who came to Ateneo on Saturdays to attend free marketing courses exclusively organized for them. The graduates were given an Ateneo certificate to help them start their careers with greater advantage. The AMOR project became my peg and inspiration when former Johnson and Johnson ASEAN president Ding Salvador and I launched MarkProf Foundation's annual 7-Weekend Marketing Leadership Bootcamp in 2004. The Philippine Marketing Association awarded me the Agora Awards for excellence in Marketing Education in 1994, the youngest to receive in that category to-date and the only 'part-timer' to be awarded so far, chosen over four other PhD holders then. I am grateful to the panel of judges for recognizing my contributions and outputs. I eventually taught at my alma mater De La Salle University when it became acceptable to everyone to have a practitioner come once a week for a three hour course. Traveling three times a week for one hour course would have been impractical given the traffic from Quezon City where I work and live to Taft Avenue. I taught at the DLSU undergraduate level first, then at the Masters of Marketing program chaired by Dr. Nards Garcia but the MBA School under Dean Philip Juico accepted me to teach in their Ortigas campus which was much more convenient and accessible. In-between my teaching schedules, Ambassador Bienvenido Tantoco of Rustan’s Group established a professorial chair in retailing and marketing at Jose Rizal University and made me its first professorial chair-holder. I taught once every semester for two years to an audience composed of both students and some practitioners in the school's auditorium. I returned to the Ateneo, where it all began, in the mid-2000's to teach Blue Ocean Strategy. Today, my wife Chiqui is the one who teaches at the Ateneo (but presently on leave to do her anthropology thesis--her second masteral degree). I am her substitute teacher when she travels abroad or when she needs someone to be a panelist in her class. I am glad that while my marketing is using the lens of innovation as a fusion to create marketing strategy, Chiqui is using the lens of anthropology to create a different marketing perspective. Our dream teaching assignment is to bring along some of our marketing friends and teach in different provinces for a few weeks in a year. It would be great to influence the lives of many young people outside Metro Manila. Josiah Go is Chairman of Mansmith and Fielders, Inc. (www.mansmith.net). He is first and foremost an entrepreneur but always an educator at heart. He continues to share his knowledge via his personal speaking engagements, seminars, books, newspaper articles and blog at www.josiahgo.com. Email him at josiah@mansmith.netfor questions or feedback.